Ford chose 19 major U.S. markets to introduce the electric Focus based on existing hybrid purchasing trends, utility company collaboration and local government commitment to electrification. DETROIT -- Ford Motor Co. will target 19 major metro markets late next year when it launches the Ford Focus Electric compact in the United States. The first markets to get the EV are Atlanta; Houston and Austin, Texas; Boston; Chicago; Denver; Detroit; Los Angeles; San Francisco; San Diego; New York; Orlando; Phoenix and Tucson, Ariz.; Portland, Ore.; Raleigh-Durham, N.C.; Richmond, Va.; Seattle; and Washington. Ford chose the initial markets based on existing hybrid purchasing trends, utility company collaboration and local government commitment to electrification. The Focus Electric will be available in late 2011, with Ford building it at its Michigan Assembly plant in Wayne, Mich. Production will occur on the same line as the gasoline version of the Focus. Ford has been awarded a $5.9 billion loan from the U.S. Department of Energy to retool two truck plants to make more fuel-efficient cars and update other facilities through 2011. Instead of a traditional gas engine, the Focus Electric's motor will be powered by a 23-kilowatt lithium ion battery. The system uses liquid heating and cooling systems to maximize battery life and driving range. Ford is targeting the Focus Electric to travel up to 100 miles on a full electric charge with zero CO2 emissions. 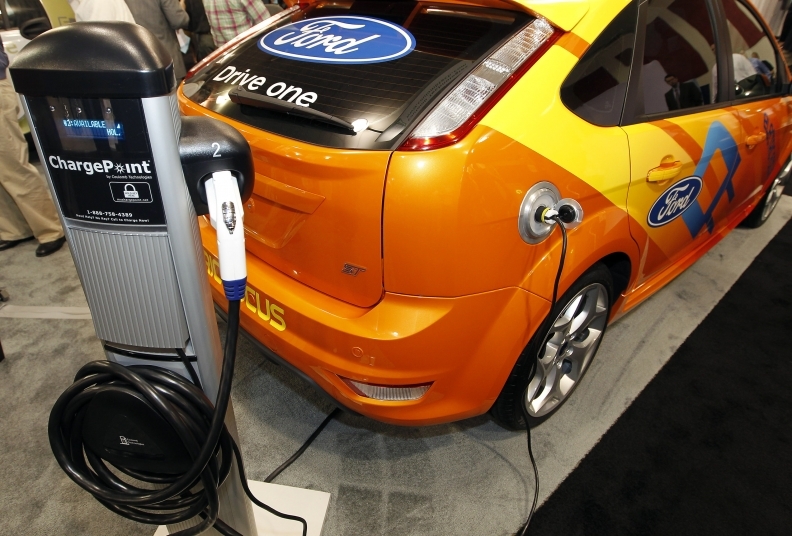 As part of the introduction, Ford is developing consumer outreach and education programs on electric vehicles. The company also will share information on charging needs and requirements to ensure the electrical grid can support customers' needs. Last month, Ford launched a new educational Web site on electric vehicles. The site offers video, text and other information to help consumers understand the differences in electrified-vehicle technology. Ford is launching five new electrified vehicles in Europe and North America. Besides the Focus Electric, Ford will introduce the Transit Connect Electric small commercial van, two next-generation lithium ion battery hybrids and a plug-in hybrid.